On 19th September 2014 the German upper house of parliament, the Bundesrat, discussed the draft legislation from the German federal government on the amendment to the Federal Immission Control Act (BImSchG), and expressly welcomed the fact that – as planned in 2009 – the previous biofuel quota in the transport sector was to be abolished and in its place, a greenhouse gas reduction quota would be introduced in 2015. The Bundesrat described this step as being a clear improvement to the climate balance of biofuels, as an incentive for the de-carbonization of fossil fuels, and therefore as an important contribution to protecting the climate. Since power-to-gas technology had been ignored in the previous draft legislation, the Bundesrat also expressly requested the federal government to include power to gas as a method for the production of green hydrogen in the paper. On 13th October 2014, the German lower house of parliament, the Bundestag, then passed the legislation with these amendments. The federal government also confirmed that over the medium to long term, fuels of this kind could make a contribution to climate protection with fuels. In April 2015, the European Parliament discussed the Renewable Energy Directive (RED) and the Fuel Quality Directive (FQD) concerning the offsetting of different fuels against the greenhouse gas reduction quota. It decided that the EU member states will have to ensure that by 2020, at least ten percent of the energy consumed in the transport sector is covered by renewable energies. While the proportion of biofuels from the first generation is limited to seven percent, biofuels from the second and third generations will be subsidized with multiple offsetting. In the case of hydrogen which is gained from renewable energies, the politicians decided against quadruple offsetting, but in favor of the double offsetting of its energy content for the greenhouse gas reduction quota. Diwald further explained that a temporally limited triple offsetting would be enough so that the price of fuel does not increase in the future. With a double consideration, it would be 0.1 to 0.2 percent more expensive. Diwald stated further that this multiple offsetting was actually a “cheat” from the climate point of view, since the multiple quantity of carbon dioxide won’t really be saved. He justified this step by pointing out that with the use of hydrogen at the end of the energy conversion process, with the fuel cell, a highly efficient energy transformer was available, so that in comparison with the consumption of crude oil in combustion engines, a gain in both efficiency and environmental friendliness was evident. The DWV Director also pointed out that biofuels in combustion engines. He stated that engines of this kind have almost reached the end of their scope for optimization, however, which means that an effectiveness level of 21% is barely achievable. Fuel cells, however, offer the possibility of an “increase in efficiency of 50%”. Hydrogen also helps to reduce the dependency on crude oil. Whether this decision is actually the last word from Brussels remains to be seen. Different sources have already reported that a step model could be used to improve the position of hydrogen. The next step, however, is for the Brussels regulation to be implemented into national law via an ordinance in every EU country on a voluntary basis. 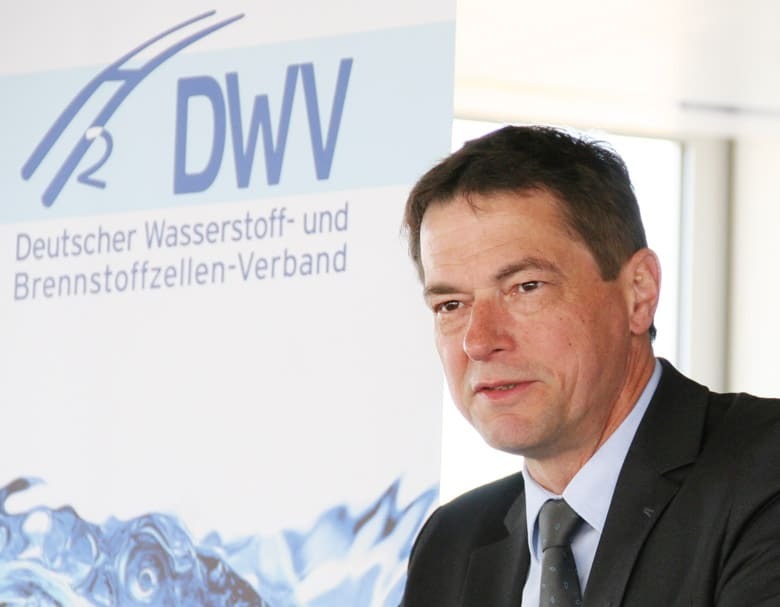 The DWV therefore appealed to the German Bundestag to complete this step consistently and with immediate effect. Bernd Westphal, member of the German Bundestag and member of the Committee for Economy and Energy, explained that it may be possible for this to take place during this legislative period. According to the EU decision, the European regulations have to be implemented by 2017. According to the Federal Office of the Environment, purified biogas and electricity which is produced on a renewable basis are viewed to be “the most promising long-term candidates in terms of climate protection for providing an important contribution to the sustainable provision of energy to transport on the basis of volume”. Biofuels from the first generation, however, are viewed to be inefficient, while further research is needed into biofuels from the second generation (e.g. BtL). According to the UBA study on Post-fossil energy supply options for a greenhouse gas neutral mobility, hydrogen is described as being “a very long-term option (beyond 2050)”.